Roy Thomas story Howard Chaykin art Howard Chaykin & Tom Palmer cover. Part 1 of Star Wars: A New Hope movie adaptation. 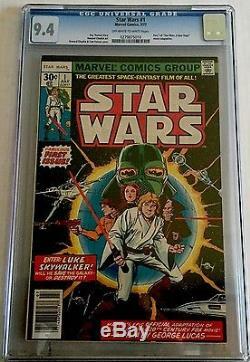 The item "STAR WARS (1977) # 1 OFF-WHITE WHITE PG CGC 9.4 NM HOT BOOK 1st PRINT 0279875010" is in sale since Monday, May 23, 2016. This item is in the category "Collectibles\Comics\Bronze Age (1970-83)\Superhero\Star Wars".